Borów Polski lies near to the border of the Lubush and the Lower Silesia Provinces. As to arrive in there you ought to, from Bytom Odrzański, make down the road no 292 for Nowa Sól. After 5 km turn left, into the road no 283 to Kożuchów and right away turn left again to Rejów. At the crossroads in Nowe Miasteczko you have to turn right to Borów Wielki and driving on straight ahead you cross Borów Polski. There you need to turn into the first road to the right. It is ahead of the church, a stony and a very narrow one. Down it you reach the very ruins. 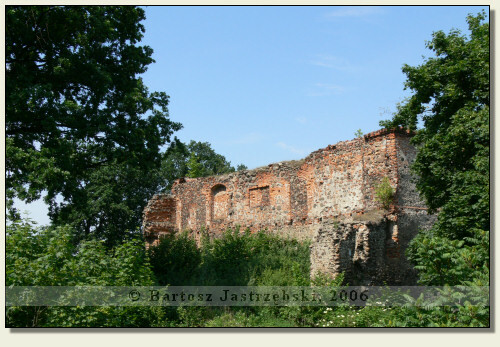 The history of the knight’s castle in Borów Polski is not well learnt. It came into being probably in the XIVth cent., and in the years of 1548-1550 was converted into a renaissance mansion by Georg Rechenberg (Rochenberg). 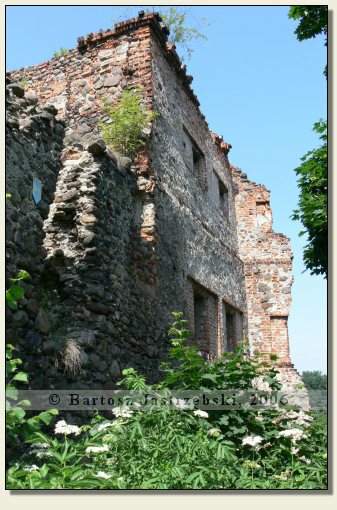 In the middle of that conversion was raised the house, the ruins of which you can watch nowadays. After 1649 the building became the property of the Jesuits and started falling into a disrepair. 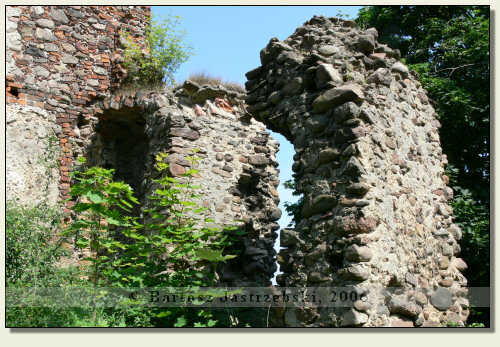 The castle tower collapsed before 1800, and in the middle of the XIXth cent. the part of medieval walls was disassembled. The XVIth century building, which was not dismantled, was converted into a granary. From the report of one of elderly inhabitants of the village follows that the building was utilized at least until the World War II. 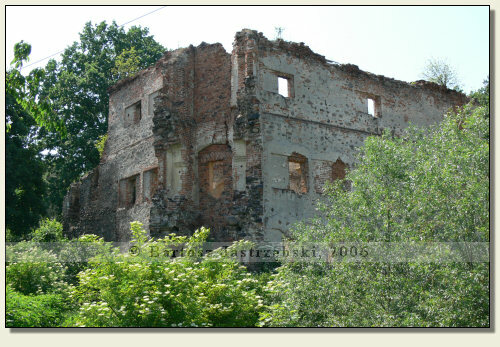 When the Soviet Army invaded there the castle was utterly looted – the soldiers were exporting as much as possible by the trucks, including tiles coating the floor.